How do I disable R/C autocalibration without turning off the signal timeout on a Sabertooth? 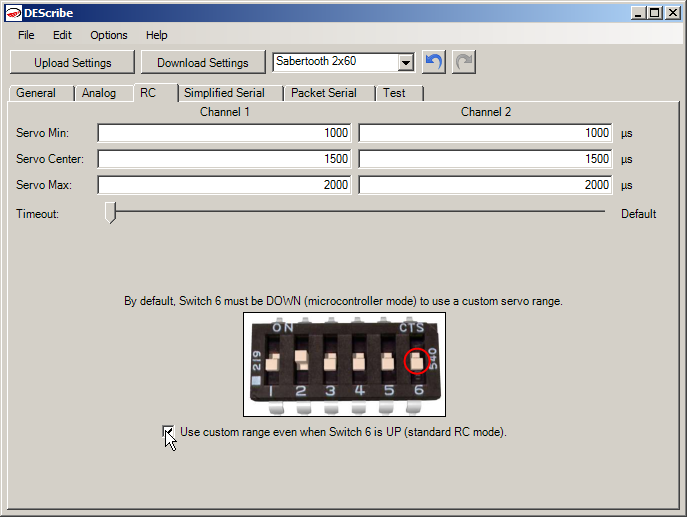 While SyRen and R/C-model Sabertooth drivers have separate DIP switches for autocalibration and signal timeout, most Sabertooth drivers have a microcontroller mode DIP switch. This lets you choose between, on the one hand, automatic calibration and signal timeout, and on the other, fixed calibration and no signal timeout. Go to the RC page in DEScribe and check "Use custom range even when Switch 6 is UP (standard RC mode)". Then set Switch 6 to UP. This will disable microcontroller mode (turning signal timeout on) while using the fixed calibration you've specified.